Arya doing cameo for Vishnu's Indru Netru Naalai! Vishnu Vishal's Indru Netru Naalai is progressing well. Latest we hear that Arya is going to play cameo role in the movie. Home » Arya | Director Ravi Kumar | Indru Netru Naalai | Mia | Vishnu » Arya doing cameo for Vishnu's Indru Netru Naalai! Arya and Vishnu are great friends. 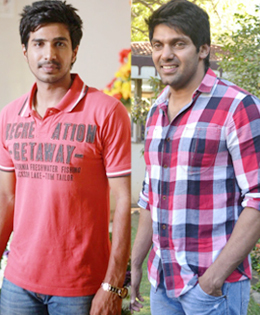 After distributing Vishnu's Jeeva, a movie on Cricket directed by Suseenthiran along with Vishal, Arya is now sharing screen space with his co-cricketer in Indru Netru Naalai directed by Nalan's trusted associate, debutant Ravi Kumar. "Thanks a lot to my very very good friend @arya_official_ :) once again a small cameo in my mov INDRU NETRU NAALAI..:) #anythingforfriends." Indru Netru Naalai is touted to be a sci-fi flick with ample doses of comedy and romance. Jointly produced by CV Kumar's Thirukumaran Entertainments and KE Gnanavelraja's Studio Green, Indru Netru Naalai casts Mia George as the female lead. It is the second time for the Vishnu - CV Kumar duo after Mundasupatti. Karunakaran, Jayaprakash and Anupama Kumar will be seen in pivotal roles. With Leo John Paul handling editing, Hip-Hop Tamizha is composing music.